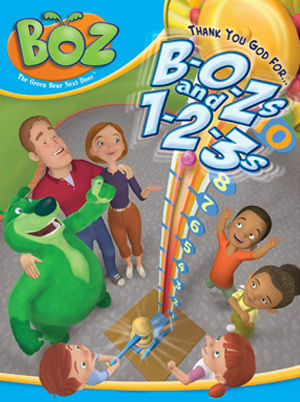 Laugh, Love and Learn with BOZ! BOZ, Drew, and Gracie learn how to creatively use their God-given imaginations to dream of wonderful ways to play, explore, and even help others! What If? - One little question can open up a whole big world of exploring new ways to show that we can help others. God gave us all big imaginations so we can pretend to be anyone we want to. The kids explore the possibilities in a musical and imaginative way. BOZ shows them how to laugh when they think up several silly "what ifs." Grampie B arrives and everyone helps him load up his truck with canned goods for a local food drive. BOZ proclaims, “God loves it when we help each other.” The group uses their imaginations to think of ways to make “Our Wonderful World” a better place. BOZ, Drew and Gracie enjoy an exciting day reading and helping Grammie B at the library. With BOZ's help, Drew and Gracie learn that imagination makes books and stories come alive. They find out that the more you read the more your imagination grows. Using the very special gift of imagination that God has given us, they make up some stories of their own. Gracie imagines a world where she is a princess and lives in a big castle. BOZ, the friendly green giant offers to help Princess Gracie by picking blueberries that she can't reach. Suddenly, race car driver Drew enters the fantasy land and offers her a ride. If you use your imagination anything can happen in “The Land of Make Believe.” All learn that the library is full of fun and exciting books that you can check out and take home with you. BOZ and the twins discover how to use their imaginations to create things and see things a different way. In God's world of endless possibilities, a box isn't just a box if you make believe its part of a great adventure. Drew and Gracie construct a pretend restaurant out of cardboard boxes and serve BOZ some imaginary pancakes. Imagination can turn a cloud into turtle or an ice cream cone and the tire swing into a spaceship or a doughnut with sprinkles. A rain storm drives them inside and BOZ shows them that they can use their imaginations to draw, sculpt, dance, sing or even to create pretend instruments for an imagination band. With BOZ playing the imaginary guitar, Drew on the imaginary piano, and Gracie on the imaginary drums, the imagination band has fun playing some catchy tunes about using imagination. Getting everything squeaky clean — including ourselves — is lots of fun! Drew and Gracie discover exciting ways that numbers and letters can help us explore God's world. Begin the countdown to F-U-N and B-O-Z! O Say Can U C? Gracie and Drew learn they can spell all kinds of wonderful things in God's world after BOZ sends them a special delivery. BOZ has sent them letters that have actual paper letters inside that make up the letters in their names! BOZ and the twins celebrate how the letters in their names are very special and will always be the same. As they spell out their names, a sudden gust of wind blows the letters all over the backyard. BOZ, Drew and Gracie set out to find the letters and along the way come across different words that are spelled out by the letters. They also sing about the “Lonely Letters” that don't get used as much as the others. BOZ helps Drew and Gracie discover how many letter “Os” there are all around them. This musical special letter search spells out F-U-N! BOZ wakes up to a special surprise. It's the First Annual Baxter Neighborhood Carnival right in his backyard! At this counting carnival, the counting never ends. BOZ is given ten tickets to play a variety of counting carnival games including ring toss, the milk bottle game, and even a chance to catch plastic fish. Unfortunately, he's so excited that he just can't seem to win at any of them. Even though he has not won any prizes yet, BOZ shares with all of the kids the valuable lesson that the fun is in the trying. With everyone cheering for BOZ, he has one last ticket to take a chance on a carnival game that no one has won all day. Count on lots of great songs and adventures for BOZ and all his neighborhood friends at this First Annual Baxter Family Carnival! A sharing disagreement between Violet and Buster has Drew and Gracie choosing sides. Can BOZ help the twins creatively work through their differences? BOZ explains to Drew and Gracie that there is no better way to show how much we love God than to “B” nice to each other. The letter “B” is used throughout this musical story as BOZ inspires Drew and Gracie to come up with a creative way to say you're sorry. All ends well as BOZ, Drew, Gracie, Grammie and Grampie B and their pets learn an important lesson on how to treat others. BOZ, Drew and Gracie help your children discover that God is pleased when we share His blessings and help others! BOZ and the Baxter Family are ready for some spring cleaning! All are busy collecting things for donation to families in need. Drew and Gracie learn that by giving away some of their things, we share God's blessings with people who are less fortunate. While cleaning out the garage, Drew discovers his Dad's favorite toy - RescueMan. 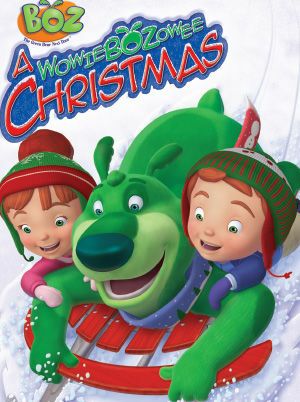 In the spirit of the day, Mr. Baxter decides that RescueMan should also be donated to bring joy to a child without a toy. Mrs. Baxter joins in by donating a lot of her old books. So, BOZ, Drew and Gracie use their imaginations to explore the fun that reading a book has to offer. By helping their Mom and Dad, the twins also demonstrate that little kids can be a big help on any project. All have learned that by sharing things we have, we can help people in need. We can always do good deeds to help others… and have fun along the way! BOZ and the twins excitedly get ready for a day at the County Fair. Unfortunately, Grammie B has hurt her ankle and will need their help completing her Saturday chores. Though disappointed about missing the fair, BOZ explains that even though we don't always get to do what we want to do, we can always help others and have fun doing it. They make the most of Grammie B's to-do list, treating the tasks as a “Helpers Fair.” Blue ribbons are earned by all…including pets Buster & Violet. Once the work is done BOZ leads the group in singing “Making Lemonade.” Grammie B surprises BOZ with his favorite desert, a delicious fresh baked cherry pie. A Lesson for the Teacher! Friends enjoy helping one another learn how to do new things! BOZ, Drew, Gracie, Bria and Marcus enjoy a day of play. Gracie teaches Bria the tricks of the trade involved with playing hide and seek. After that a musical game of follow the leader begins with BOZ telling the kids to “Do What I Do.” Later, Gracie doesn't want to join the group in jumping rope. She admits to BOZ that she doesn't know how to do it and is a little afraid. BOZ reminds her that friends enjoy teaching new things to others, just like she helped Bria with hide and seek. We can try new things when we are willing to learn from others. Gracie asks for help, which Bria is more than happy to provide. In no time Gracie is jumping rope and having a great time. 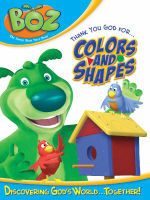 When BOZ, Drew, and Gracie explore God's world, they count on discovering colors and shapes everywhere! Colors grow plentiful when we spend time outdoors exploring God's world. Over at Grammie B's garden, Drew and Gracie attempt to help find Grammie's missing glove. While they are searching, they explore the many colors of a garden in the song -“God's Green Earth Is Not Just Green”. Grammie B gives the twins a jar of imagination seeds. BOZ comically digs a massive hole in the ground to plant these seeds. While down below ground he discovers Grammie's missing glove. Once the seeds are planted BOZ encourages them to imagine what the seeds will grow into. The twins imagine a flower which is larger than the whole house. Clouds begin to move in and it starts to rain. BOZ explains that the water is good for the seeds that they just planted. After the rain shower, all enjoy one of God's greatest pictures - a colorful rainbow! It's shaping up to be a great day for imagining what we can do with the shapes we find all around us. From BOZ's treehouse platform, BOZ, Drew and Gracie play a game of “I Spy” by peering through a cardboard tube. They discover that shapes are everywhere. Grampie B and Mr. Baxter are busy building a new dog house for Buster which causes the kids to want to try building something. Grampie B allows them to borrow some of his old scrap wood. Using their imaginations, BOZ and the twins quickly realize that shapes can make race cars, castles, mountains, and even spaceships. Eventually they decide on building a birdhouse using three very special shapes…the circle, the triangle, and the square. The Drew and Gracie ask for BOZ's help with a church project that they are working on. They are attempting to show 5 ways that God loves us and 5 ways that we love God. BOZ takes Drew and Gracie on a tour of God's love. Their transportation is a special 3-wheeled BOZmobile. After a quick spin around the yard they wind up exactly where they started. BOZ points out that God's love is around us every minute of the day. God gave us air to breathe, beautiful trees and flowers, eyes to see, a nose to smell, and ears to hear. Just five of the ways that God has shown his love for us. Now the attention is turned to finding ways to show our love for God. Helping their parents by cleaning their very messy room, helping BOZ with a new birdhouse, taking care of the world, taking care of God's creatures, and learning to share are all examples that they come up with. We can always count on the many ways God shows us His Love. With Christmas fun, sing-along carols, and a special retelling of the Christmas story, BOZ and the whole Baxter family help preschoolers everywhere discover that the very best presents are the ones that come from the heart, especially God's most wonderful gift ever — Jesus.